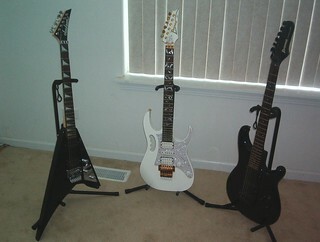 These are my axes. There are many like them, but these three are mine. I’ve had a love / hate relationship with the guitar my whole life. I love playing it, but I hate how I sound and I’ve always had a hard time being disciplined enough to make progress in a way that actually makes me feel satisfied. Bottom line, I’ve always hated how I played. One guitarist I always admired when I was younger was my younger brother Ed. He had an incredible love for the guitar from the time my Dad picked up our first “Hornsby’s special” $20.00 acoustic guitar for us when we were 10 and 12. He never put it down. 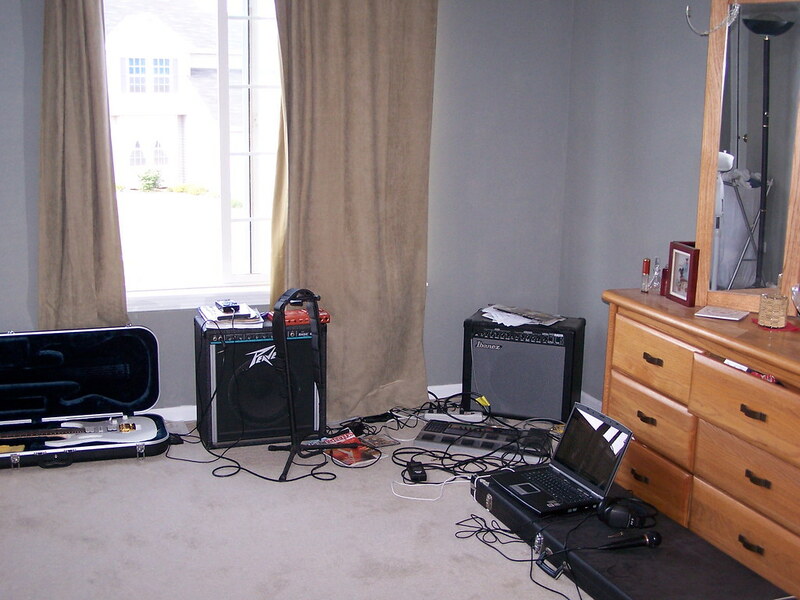 I remember walking into our bedroom and seeing him sitting on the floor next to the bed working through Jimmy Pages solo from HeartBreaker on this little crappy accoustic guitar and actually sounding pretty good. I could never do that. I didn’t have the patience. I still always loved the guitar though. When I was seventeen, I put an Ibanez on layaway and paid on it for months in order to get it. That’s it on the right hand side of the picture. Ed bought a red Ibanez later on. When Ed was around 15, he had a friend that had a 4 track studio complete with a PA and a drum machine and he and this friend locked themselves in this studio for weeks working on a song. This was really cool to watch, as I had no idea at the time what was involved and it seemed like Ed knew everything. He sat in that studio doubling guitar tracks, harmonizing leads and blowing me away with how much he intuitively knew about the process, at least from where I was standing. That picture has always stuck in my head. It was so cool seeing my younger brother in a basement studio creating music. I was so proud of him, and to be honest, just admired him for how committed he was to the guitar and how well he was able to play. To this day, the solos for this song have stuck with me, though the tapes are long gone. I lost them. 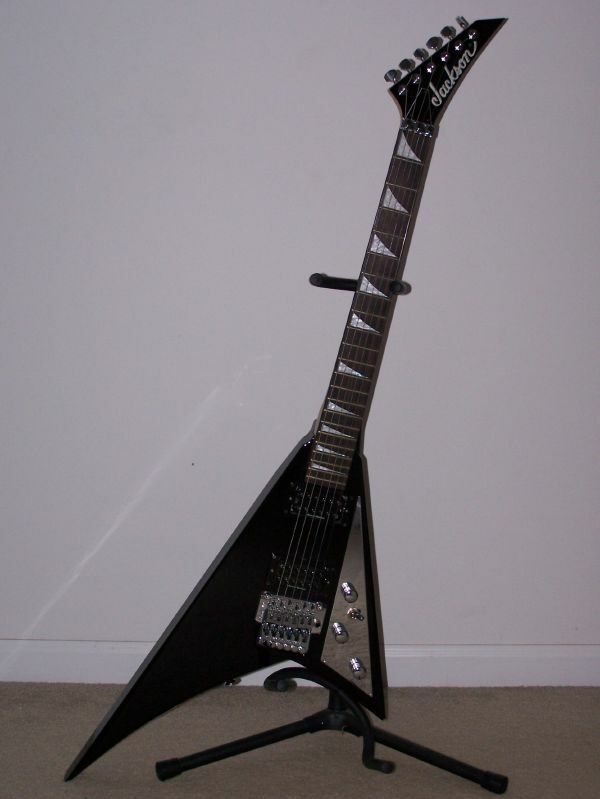 In June, Jonna bought me an Ibanez JEM, a guitar I had wanted for a long time. Since she had made the investment, I figured I should at least attempt to start practicing again so that the JEM didn’t just sit there like the Ibanez (and later the Jackson Randy Rhoads Custom pictured on the left) had for so many years. I figured the best way to get back into the swing of things was to try to transcribe one of these solos that had stuck in my head forever as kind of a tribute to my favorite guitar player. So here it is. My tribute to my favorite guitarist. This is the ‘outro’ solo to that song that I watched my brother write and record in that little home studio 20 some years ago. I have recreated it as best as I could given my memory and limited playing ability. I am playing all rhythm, lead, and bass guitars. I also doubled all lead guitars as I remember he did. This was recorded sitting on the floor in my bedroom on my Digitech GNX4 8 track recorder. It’s definitely not perfect, but it is what it is. A tribute. I hope you like it. If not – he wrote it 🙂 Add to the formula. He was about 15. Addendum: After that muted part at the end he did this weird arpeggio stuff that was supposed to be faded out. It was amazing, but I have no idea how he did it, so its missing. This entry was posted in Music and tagged Guitar, Music by Ron Bieber. Bookmark the permalink. Now, it’s your brother’s turn to be proud. I’ve always thought that the hardest thing is to capture the nuances of someone else’s playing. This piece is very well done and shows attention to detail way beyond playing the notes. The tone and dynamics create a mood and coherency that make this piece more than the sum of its’ parts. Every guitarist has aspirations and things they wish they could play, but that’s no excuse for hiding your light under a bushel. Say what you need to say with the vocabulary at hand. It’s all about the journey….